One of the challenges I face during the summer is finding a way to successfully entertain my daughter without breaking the bank. 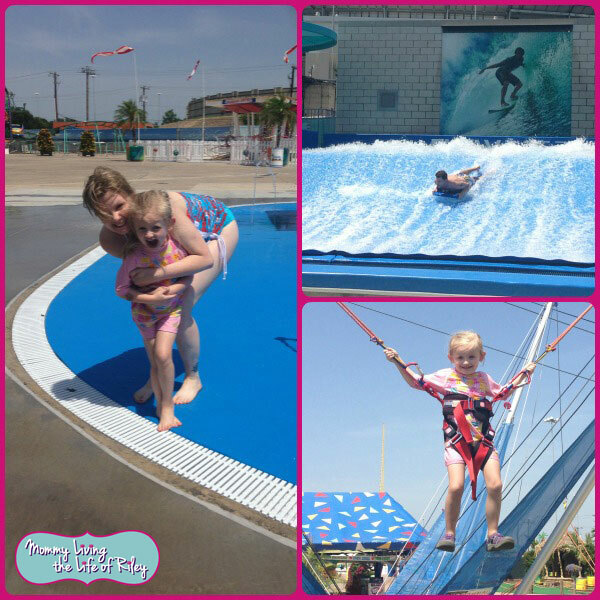 Finding a great source of family fun is a must when trips to the pool and park begin to get a bit stale. Also, what do you do when the temperatures are scorching or it's raining outside and your child has already seen the latest summer blockbuster? That's when it's time to visit your nearest Dave & Busters to experience all of the amazing summer fun that awaits. My family and I recently had a chance to check out their newest creations especially for summer and we couldn't have been more delighted at what we found. Keep reading to learn more! When we first arrived at the Houston Dave & Busters location on the Katy Freeway, Adrian, the general manager, greeted us warmly and told us that he had quite a lot in store for us...which he did! First, we were sent to the restaurant area of the establishment and sat at the large bar where Roman, a professional mixologist, made some yummy concoctions for us! 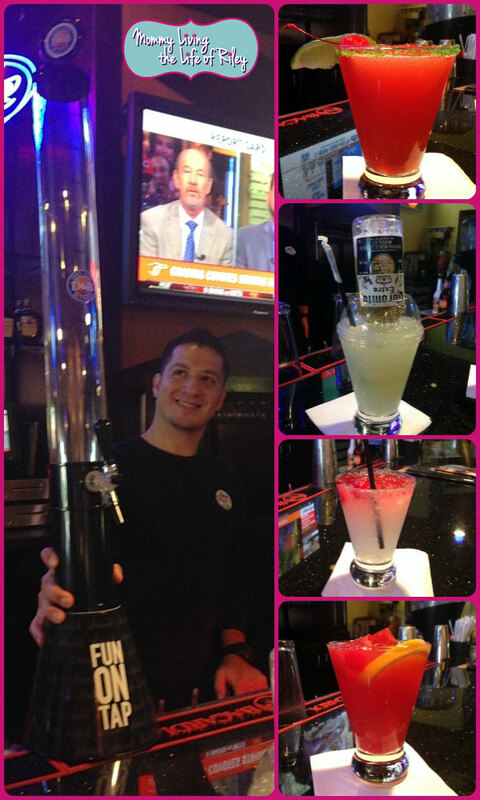 Dave & Busters is featuring four new alcoholic beverages this summer and we had the chance to taste them all. What's more, Roman put on a fantastic show while making these drinks and I instantly felt like I was on the set of the movie, "Cocktail!" The four new summer drinks at Dave & Busters are the Strawberry Sangria, Miami Ice, Coronarita and Strawberry Watermelon Summerita. They are all made fresh before your eyes by a friendly bartender and don't come pre-made from one of those margarita machines. The Strawberry Sangria offers a blend of Cruzan® Strawberry Rum, Canyon Road® White Zinfandel and Strawberry Bacardi® Premium Mixer, poured over strawberry ice cubes and topped with a splash of club soda. The Coronita is a fresh frozen margarita slushie of sorts that contains a 7 oz Corona® engulfed in a refreshing margarita made with Sauza® Blue 100% Blue Agave SILVER tequila, triple sec and a squeeze of fresh lime. Next up is the Miami Ice drink, a coconut lover's dream come true. It features Skyy Infusions® Coconut Vodka and Malibu® Coconut Rum mixed with Minute Maid® lemonade and Strawberry Bacardi® Premium Mixer. Last but not least was my personal favorite, the Strawberry Watermelon Summerita...and I don't even like watermelon! This delicious beverage contains Margaritaville Tequila Gold®, DeKuyper® Watermelon Pucker, Finest Call® Watermelon puree and Minute Maid® Lemonade shaken and poured over strawberry ice cubes. Choose your dinner and you're already a winner! Choose from D&B's eight irresistible entrées and get a $10 Power Card plus 100 tickets starting at $16.99. ~ Sun-Thurs Open to Close ~ Fri & Sat Open to 5 pm. Bacon-Wrapped Beef Medallions and Grilled Shrimp ~ Marinated medallions of Sirloin steak wrapped in bacon, alongside garlic herb shrimp. Char-grilled and served with a medley of oven-roasted vegetables and new potatoes, accompanied with a side of tomato and basil Bruschetta. Grilled Balsamic Chicken ~ Grilled chicken breast drizzled with a rich balsamic reduction, served with a medley of oven-roasted vegetables and new potatoes, accompanied with a side of tomato and basil Bruschetta. Potato Chip Crusted Chicken ~ Tender chicken breasts in a crushed Lay’s® potato chip crust, fried to a golden brown and served with warm French onion dipping sauce, with a medley of oven-roasted vegetables and new potatoes. Chicken & Shrimp Rockefeller ~ Our grilled chicken breast is topped with a creamy spinach sauce, diced roasted tomatoes and sauteed shrimp. Mashed potatoes and steamed broccoli make your meal complete. 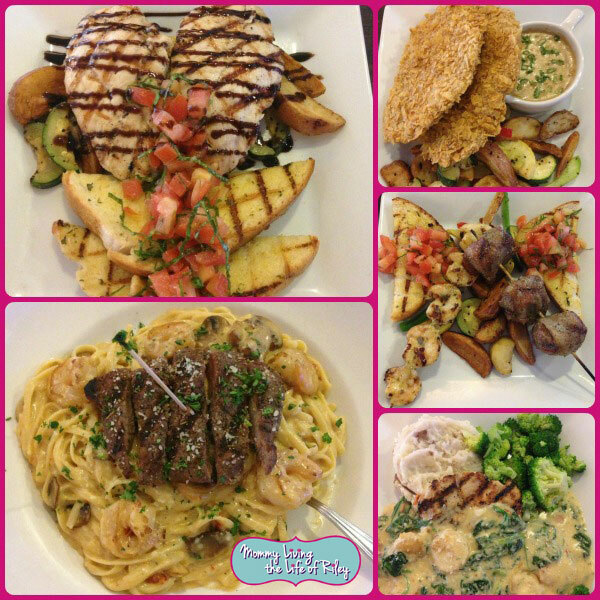 Bistro Steak & Shrimp with Lobster Alfredo ~ Serious surf AND the tastiest turf. We start with a 5 oz. Sirloin steak on a bed of linguine, then top it off with shrimp, mushrooms, roasted tomatoes and a lobster Alfredo sauce. 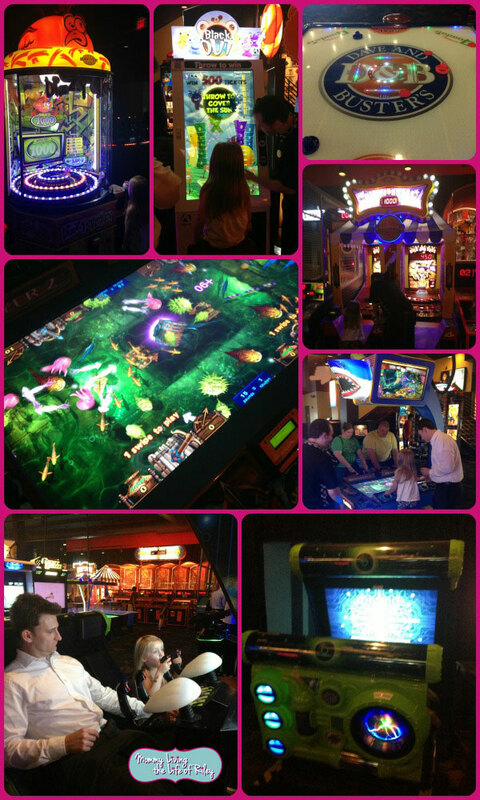 This summer Dave & Buster's is introducing 8 epic, new games into their stores. To get you into the New Mix of Fun, you can play five for free! (With same day Power Card purchase or reload). From May 20-August 18, 2013, get one free play on five new games: Temple Run, Harpoon Lagoon, Dizzy Chicken, Dark Escape 4D and Dream Raiders! Temple Run ~ Race down ancient temple walls and along sheer cliffs. Avoid obstacles, collect coins and and see how far you can run! Blackout ~ Throw the Googabunga at the darkened sun. Cover 100% of the sun's surface and win 500 tickets! Dizzy Chicken ~ Get dizzy with Bay Tek’s Dizzy Chicken! Obnoxiously fun for all ages. Plunge the ball into the spiral of lights to land it on the green target. Finesse is the key! Milk Jug Toss ~ Toss the balls into the milk jug or surrounding holes to win tickets. Shoot for the Super Bonus by getting all the balls in the jug. Dream Raiders ~ A fantastic new two-player deluxe game from Sega. Ride a dragon, pilot a UFO, get on horseback or put on your super suits and head for the skies! Harpoon Lagoon ~ 4 player game for the entire family. Players fire harpoons at the fish swimming by and win tickets. Features a hidden jelly fish bonus! Dark Escape 4D ~ See and feel the monsters in a new game that’s in a class of its own. Wearing 3D glasses, try to escape from a mad man by shooting your way out. Cut The Rope ~ The popular mobile app now on a high definition 42" touch screen! Solve the puzzles by feeding Om Nom and win big tickets. My entire family had such a great time that we couldn't stop laughing and smiling! It was definitely the kind of day that family memories are made of and we plan on visiting Dave & Busters this summer on a regular basis. Even though my family loved each and every minute of the drinks, eats and games, I have to admit that the nicest part of our experience was the dedicated staff we interacted with at the Houston Katy Freeway location. They were more than just nice, they treated us like family and made sure that we had a fabulous time during our visit. 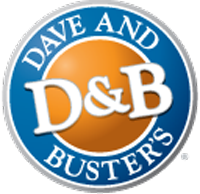 The folks at Dave & Busters definitely love what they do and they pass that joy along to their customers. Enjoy 1/2 Price Games every Wednesday from Open to Close for a limited time only! Disclosure: I received complimentary food, drinks and game plays in order to facilitate my review. This feature is based on my own personal experiences and is completely honest and objective.